The Designer to Consumer, i.e. D2C, program explores the designer to consumer business model, associated products, processes and legal issues. The industrial design practice that emerged in the 20th century, and is still prominent today, was a business-tobusiness or designer-to-business service. The designer provided design to a manufacturer who dealt with production and sales. The form of design practice that is emerging now is a designer-to-consumer (D2C) model. Here, via online sales or relationships with traditional distributors, designers have become their own manufacturers, or created something analogous to the independent record label in the music industry. The emergence of internet-based crowd funding mechanisms, such as Kickstarter, provide a low investment/risk method for small companies to test market response and raise capital. The internet is fundamentally changing the manner and speed at which products are developed, financed and marketed. By providing the infrastructure for small businesses to flourish, the internet is dismantling many of the social and professional structures erected during the industrial era. The D2C design approach parts with the division of labour, where each operation would be carried out by a specialist trained only for that task. In the past decade we have seen many professions, from the music sector to the book and movie industries, transformed. The D2C program will proceed through concrete case studies where products and start-up companies are created in order to test market response, examine the emergent value chains, and resolve the latent IPR and logistic issues. The aim is to create large profit from selling small quantities of rare products to many customers, whereas the industrial-era model entrepreneur would sell great quantities of a limited number of best-sellers. The results of the Work Package will be tested and exhibited through concrete online products and test companies at the two-year milestone. 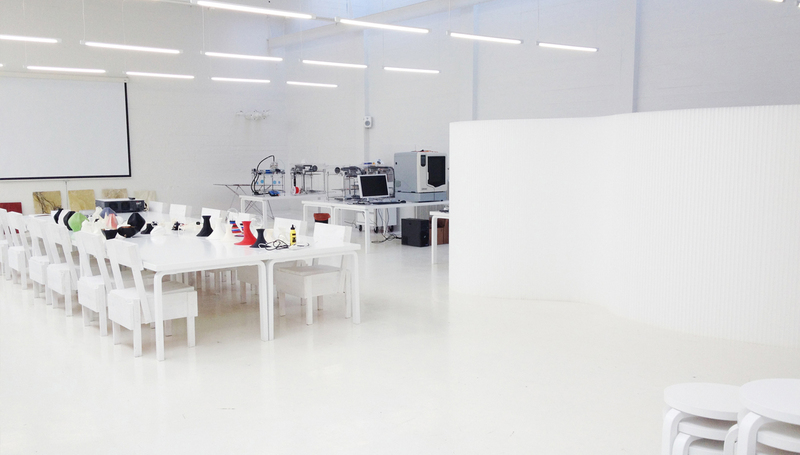 The designer-to-consumer business model is rising in prominence in industrial design. Convolute is ADD’s case study of the business model, executed through the design of a lamp that allows ample variation to lead to insightful comparisons. 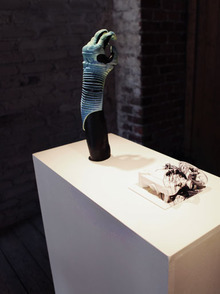 The first phase of the project was a technical study exploring the paradigms of two 3D printing machines with their own identities: 3D Touch by Bits from Bites and Uprint by Stratasys. Over 20 different iterations were designed and printed using a catalogue of polymers with each lamp having its own characteristics. The goal was to produce a high-designed, esthetically dynamic, one-off product. A lamp was chosen to allow enough variation for interesting comparisons. Chantilly is one of the most successful iterations. 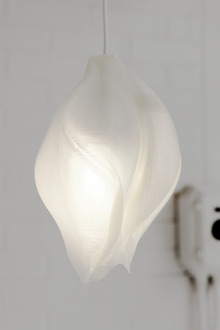 The finish material used for it was translucent PLA, well-suited for a consumer product. It was designed in Autodesk Maya as a series of three lamps with dynamic animation tools enforcing a look of movement. The lamp was designed to fit a standard bulb fitting and bulb. Black Tulip is the brother of Chantilly, developed from the same geometry with different materials, which allows the application of the form to another function. 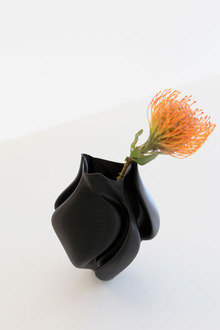 The finish material, Black PLA, is well-suited for a consumer product. It was designed in Autodesk Maya as a vase with dynamic animation tools enforcing a look of movement. Flicker shows how 3D printing allows variation with ease. A custom LED-fitting was designed inside the lamp. The installation consists of five lamps with a driver controlling the fades of the lamps to create a fluid, repeated pattern to highlight the uniqueness and complexity of the form. The installation was printed with the Uprint and designed in Autodesk Maya with the dynamic animated sequence emphasizing movement between the lamps, also supported by the lamp’s geometry.